Many other guests are performing in the concert. 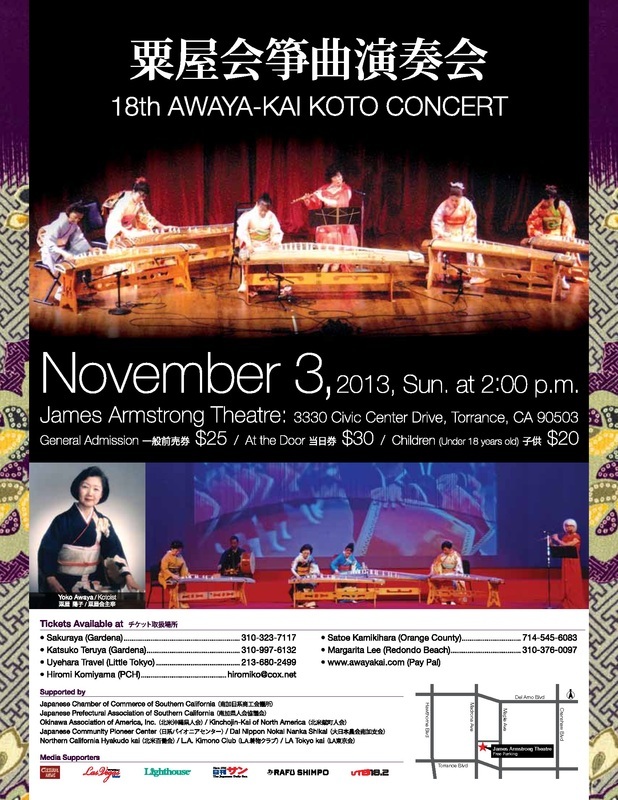 For more information, call Awaya at (310) 329-5965. Kaoru Kakizakai was born in Chichibu, Saitama Prefecture in 1959, and started playing the kena while he was in his teens. At age 21, he started playing the shakuhachi in the Kinko style. His teacher soon realized an unusual ability to play this instrument and recommended that he study with the master, Yokoyama Katsuya. Kakizakai then began his study under Yokoyama and also graduated from the NHK Traditional Music Conservatory. He is the winner of the prestigious Kumamoto All Japan Hogaku competition and has appeared on many of the CD’s and DVD’s released by his teacher, Yokoyama Katsuya, as well as being a popular teacher of shakuhachi workshop for the International Shakuhachi Training Center (Kokusai Shakuhachi Kenshukan) in Tokyo. Kakizakai has performed extensively around the world and is a faculty member of the annual summer intensive shakuhachi camps in Boulder, Colorado, and the Australian Shakuhachi Festivals. 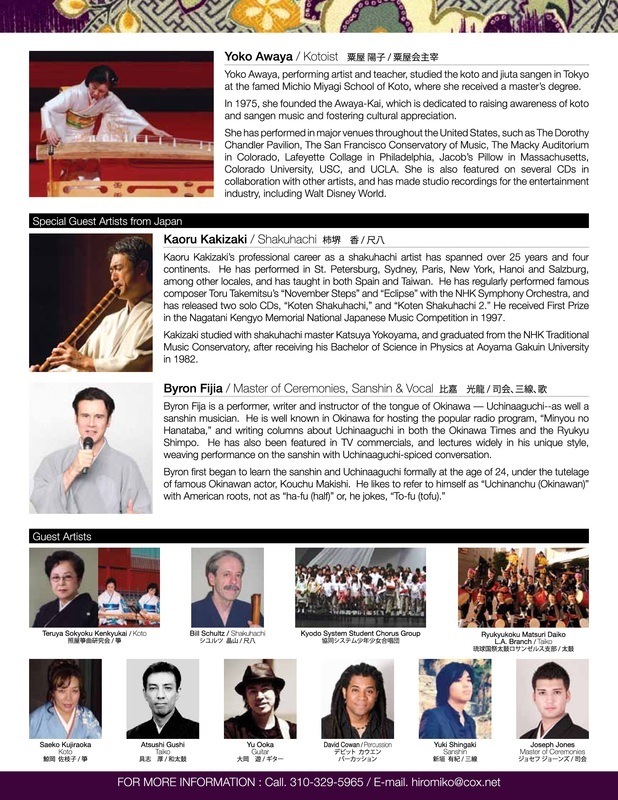 Currently, Kakizakai is a research fellow at the Tokyo College of Music, a full time instructor for the International Shakuhachi Kenshukan, and the NHK Culture Center, as well as the President of the International Shakuhachi Kenshukan Chichibu School and the Higashi Yamamoto School. He has also released two critically acclaimed CD’s of shakuhachi honkyoku. His articles are frequently published in both domestic and international journals, and he currently teaches Okinawan Language classes at schools, institutes, and universities throughout Japan. He has been invited to Duisburg-Essen University in Germany and University of Hawaii for his lecture on Okinawan Language. As of February 2009, the UNESCO Atlas of the World’s Languages in Danger has categorized “The Okinawan language” as an endangered language. Mr. Fija has been focusing his efforts to revitalize and preserve the Okinawan language by actively engaging in promoting awareness through both domestic and international lecture series. He has started playing Sanshin (Okinawan guitar) 20 years ago and now performs at many of his lectures. ©2010 Awayakai. All rights reserved.